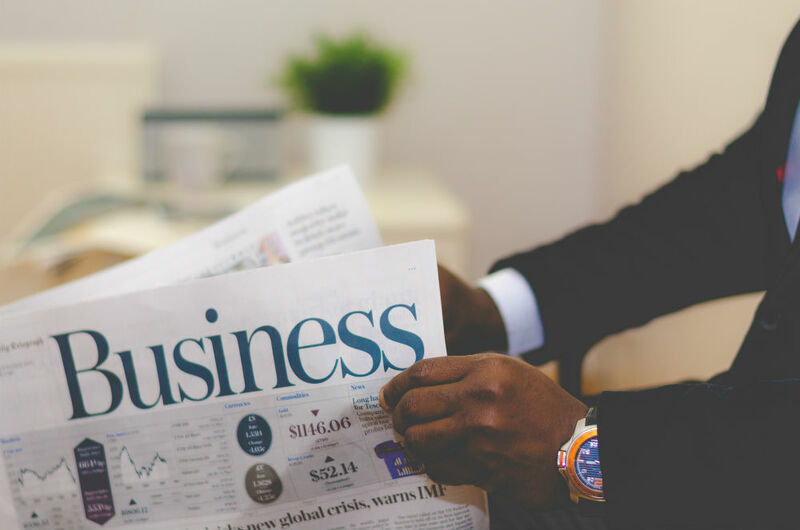 Tell us about your start-up company? In Product School, we have side projects. Did you use your company as a side project or did you build something else? Your instructor was a Product Manager at Lyft. Did that inspire you? How did you validate your idea? Aside from the project what did you enjoy about taking the course at Product School? 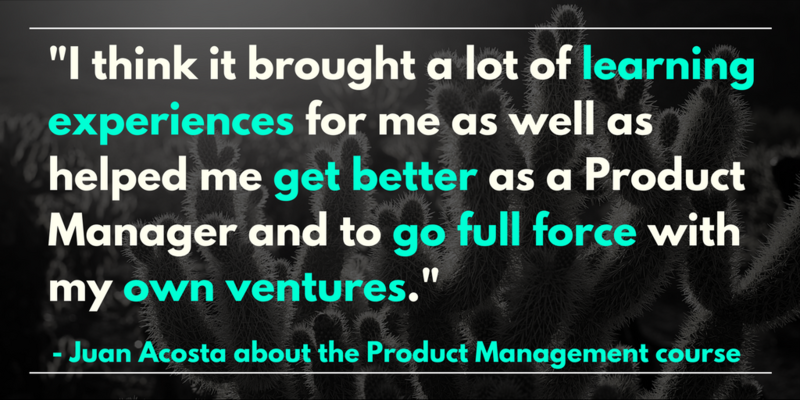 What advice would you give to people breaking into product management? Juan Acosta is a Product School graduate working at Draper University. Before becoming a Product School student, he had dropped everything and left for Silicon Valley with just one idea – to learn about entrepreneurship. He joined a program in Draper University and eventually, the same University hired him! Now he works as a Program Coordinator at Draper while also working on his own start-up company. It’s called TelZek. It’s a call answering service for self-employed people. It’s pretty much Google Voice with a personal assistant attached to it. We give you a brand new phone number for your business or you can use your current number and it works on the same device that you already have. Every call that you receive gets picked up by a professional secretary or receptionist. That allows people who are starting off or that don’t have time to pick up their calls to have a professional presence with them at all times. I struggled with that a little bit a few years ago when I had a web design business. People didn’t take me seriously because I was so young. It was hard to talk to people over the phone and have them believe that it was a legitimate business. At the same time back then my dad had a business. He had to go to various appointments a lot and because of that he wasn’t able to answer his calls. That was one of the many reasons for setting this up. There are a lot of similar companies out there but what we are trying to do is to integrate actual methodology into the product. This is one of the reasons why I took the class. I wanted to understand how to get the user addicted to the application itself as well as integrating some Artificial Intelligence. Maybe in five or six years down the line, we’ll be able to automate the process through some sort of A.I. I built something else. I thought that the curriculum, because it was only eight weeks on Saturdays, didn’t provide enough time for me to actually build an entire business plan and finished product. It might have been too intensive for the things that I was doing so I built more of an existing feature to add into the already existing app. I wanted to do it around a product that I really care about and in this case, I did it around the Lyft app. I developed all the features for it and planned it out because I would also like to be a Product Manager at one of these companies that I really like. I think it brought a lot of learning experiences, as well as, helped me get better as a Product Manager and to go full force with my own ventures. Lyft has always been one of those companies that I really look up to. I’ve been following their history for quite a bit. The fact that the instructor was the Product Manager at Lyft did affect my decision. The reason I did it was because it allowed me to see other insights to the company and get his perspective. I also got feedback from the Product Manager there rather than doing it around another company and perhaps not getting the same feedback. It’s called Lyft Groups. Right now it’s for businesses. It allows you to call multiple lifts at once from the same device rather than using several devices. You can call lifts for a group of people that is more than six people. If you have 20 passengers you can log into the app just like any regular Lyft. If you request Lyft Groups, you will get maybe two or three rides depending on whether it’s a Lyft Plus or a regular Lyft and they will come and pick up the group at the same time. Right now I’m a Program Coordinator at Drapery University and as part of the job I work with a lot of people that regularly book buses for their staff and for their students that go to their program. We usually have about 20 people that we have to take from point A to point B. For me, this was the perfect demographic to go and talk to because these program coordinators face the same problems every week. They have to book a bus which requires extensive hours to go back and forth with the bus company. I think they are the ones that experience the pain point the most and I thought it was a very good segment to start with before moving it up to the general public. The best thing, in my opinion, was actually having a real product manager teaching the course. The curriculum was great but if you are really set on becoming a PM, you could probably find the information on your own reading books and networking. But it would take you a long time to do so. The fact that there was a real PM there with you during the whole eight weeks was a big benefit for me. They give you a lot of the insights within a company from their experiences and you can’t get that anywhere else. It matched the curriculum very well. There were several cases where we would see something in the curriculum and it would match with the instructor’s experiences in real life. It puts the theory and the actual experiences together. That was something that I haven’t been able to find anywhere else. I’ve gathered a quite a bit of mentors from product management backgrounds over the past few weeks that I’ve met at Meetups and through Product School. Usually, I’ve heard that product management is such a hard area to get into and that it’s usually from within the company. As soon as I tell people that I did a whole class related to product management and that I was able to bring in my past experiences into jobs to tie it in with the class they think it’s the perfect thing to do. Taking the time for the eight weeks to study it with somebody that’s a real PM at a real company, I think that might be the best way to go. Also, getting mentors that have done this job is useful. 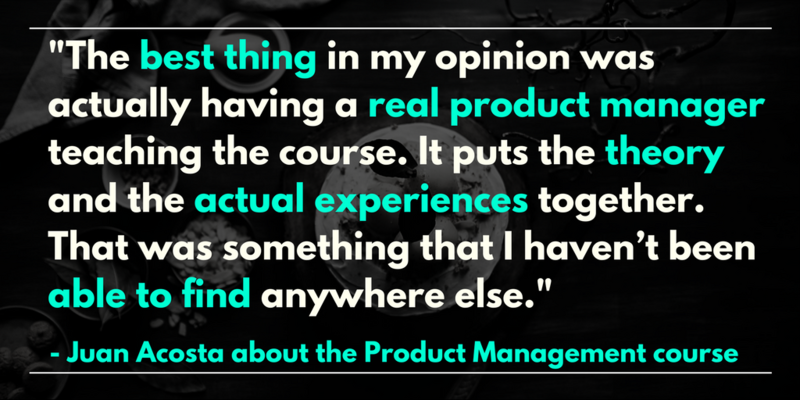 I think some of my experiences perhaps weren’t called product management but now that I look at the curriculum, all the things we did in class and my experiences from before it ties in very well. At some point in my life, I was dealing with users, at another point, with developers and then with business related things, so everything has tied in very well for what product management role consists of.